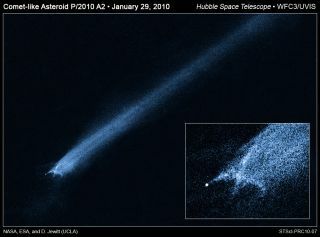 Hubble Space Telescope observation of an asteroid known as P/2010 A2 trailing debris following a suspected collision. An asteroid that zooms inside the orbit of Venus has lost its magnetic mojo, perhaps after clearing out the debris along its orbital path, a new study reports. Three decades ago, NASA's Venus Pioneer Orbiter noticed that the near-Earth asteroid 2201 Oljato caused a flurry of magnetic activity whenever it arrived inside Venus' orbit. But more recent observations by the European Space Agency's Venus Express probe don't pick up the odd phenemonon, researchers said. Oljato orbits the sun every 3.2 years. The Venus Pioneer Orbiter saw the 1.1-mile-wide (1.8 kilometers) space rock dip between Venus and our star three times during the spacecraft's operational life, which lasted from 1978 to 1992. All three times, the probe detected a roughly threefold increase of unusual magnetic peaks known as Interplanetary Field Enhancements (IFEs), both ahead of and behind the asteroid. But things had changed by the time Venus Express arrived at Earth's hellishly hot sister planet in 2006. "In more recent observations with Venus Express, the occurrence of IFEs is now lower than the average we find outside this region," study leader Christopher Russell of UCLA said in a statement. Russell and his team think the answer to this riddle lies in a reduction of the debris that once clogged Oljato's orbital path. "At one point in time Oljato shed boulders – mostly a few tens of meters in diameter – into its orbit and they formed a debris trail in front and behind Oljato," Russell said. "These impactors then hit other targets as they passed between Venus and the sun. The large amount of fine dust released by these collisions was picked up by the solar wind, producing the IFEs observed by Pioneer, and was accelerated out of the solar system." The reduced rate of IFEs measured by Venus Express suggests that such collisions have helped sweep Oljato's orbit clean and reduced the asteroid's co-orbiting debris cloud, researchers said. "The IFEs observed by Pioneer suggest that more than 3 tons of dust was being lost from the region each day," Russell said. "Effects associated with solar heating and gravitational perturbations have gradually nudged larger chunks of debris away from Oljato's orbit. From once being unusually crowded, the region has become unusually clear and free of IFEs." Russell presented his team's explanation for Oljato’s strange behavior in September at the European Planetary Science Congress in Madrid.